On Saturday, June 20, 2009, a team from the Centro de Estudios UFO (CEUFO) consisting of Lili Moronta, Fabian Romano and Quique Mario surveyed an area known as “El Durazno” some 95 kilometers soutwest of the city fo Santa Rosa, in an area where the wilderness and the first ridges that the locals call “cerros” can be found, some 350 meters above sea level. The survey took place along Route 14 and began shortly after 10:00 at the “La Araña” wilderness. The group took photographs of the area and chatted with local residents about a phenomenon that is not the least bit strange to them. Stories of “lights” and strange vehicles seen even in broad daylight are everyday occurences. Shortly after noon, when the team ascended “Cerro Cortado”, taking photos with digital cameras of the latest technology, they noticed nothing strange while capturing the landscape in several directions. At night, upon inspecting the first images, a photo caught their attention (displayed above) and which will be subjected to specialists for analysis. 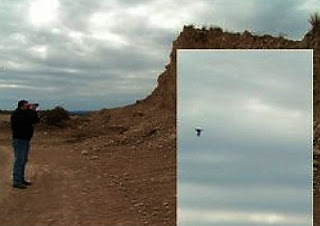 While Fabian Romano inspected the layout of the hill, Quique Mario took a photo in which a strange object can be seen flying under the cloudiness that dominated the region.